The Cake Cutting Ceremony is one of the most important parts of your wedding reception. This is the time for a very beautiful photo opp so don't rush through it. Give your photographer time to capture this very romantic moment. Be prepared. Ask your cake designer exactly where to cut the cake. 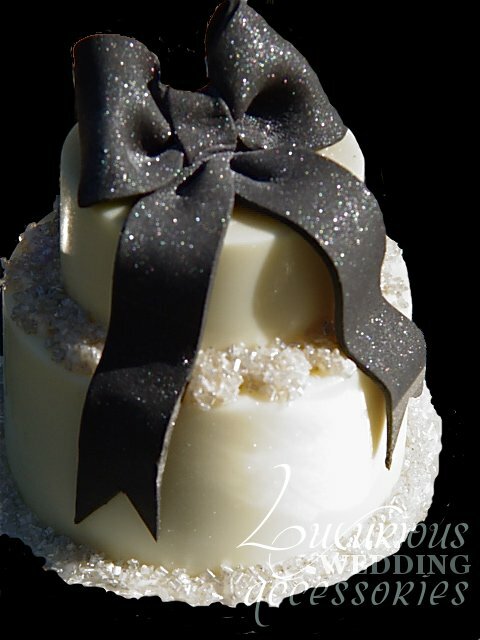 Your designer may have added embellishments that could make the cake unstable or uneatable at a particular section. To cut the cake, many recommend that you cut from the bottom tier. Use a slight coverage of oil on your Cake Cutting Set so that it cuts clean. Cut with the knife, not the server. Cut a small slice to place on a plate that you will share. Slide the slice onto the server, then place it on the plate. Use the knife to cut the slice into two small pieces. Feed each other the cake with love and gentleness. Be an adult. This is no time for cake smashing or other antics that will make your guests feel uncomfortable and make you look foolish. 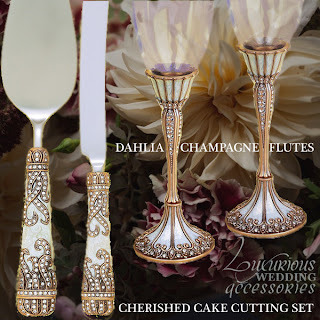 Visit Luxurious Wedding Accessories for our collection of cake cutting set. 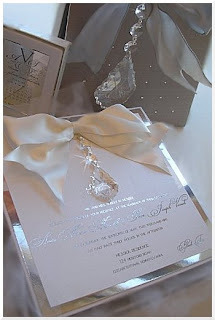 Some couples would like to state their wedding gift preference on their wedding invitation. Usually they are attempting to assure the guest that their attendance is 'The Gift'. 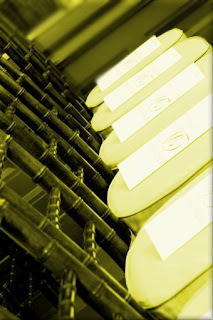 However, a wedding is a time honored tradition steeped in protocol. 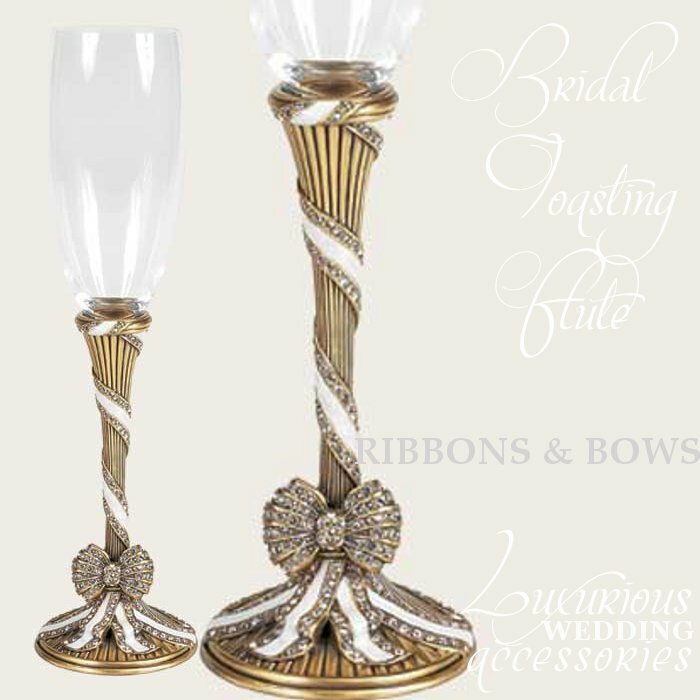 Since ancient times, Wedding Gifts have been part of the tradition and the protocol. They are a way for your guests to present something to you that they feel will add to the lifestyle you are building together. Offering a disclaimer on the wedding invitation "Wedding gifts are strictly optional - your presence at our celebration is what we really want." will throw your wedding guests into a state of confusion. They will wonder 'should we or shouldn't we'? Not wanting to offend you, they will agonize over their decision. And no matter what their decision, they will always question whether they made the right choice. 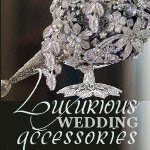 Luxurious Wedding Recommends... that you spread the word verbally about your wedding gift sentiments. 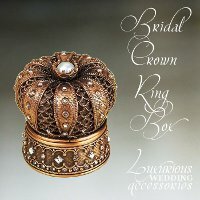 Create a Wedding Website that has a section dedicated to Wedding Gifts where you can express how excited you are and how much it means to you to share this moment with those close to you. If you are sincere about not receiving gifts, you could suggest some funny, inexpensive gifts on this page that would be taken in a light hearted manner. Many of your guest will sincerely want to do something special for you. It is always in good taste to be respectful of their wishes. Never interpret a wedding invitation as a shout out for gifts. A wedding invitation is an expression of your desire to include the invited guest in a ceremony of unity and celebration. 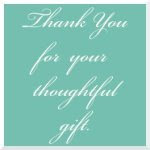 Receive your wedding gifts with grace and appreciation and immediately dash off a thoughtful thank you note. 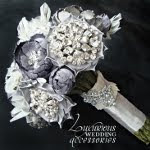 Luxurious Wedding Couture Invitation by Carciofi Design. 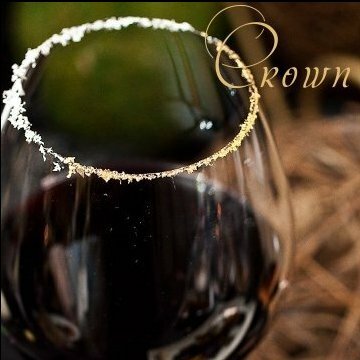 Wedding celebrations held prior to the wedding day are meant to heightened the engagement period, honor the couple, and allow you the time to spend quality time of joy with your close relatives and friends before the exuberance and “craziness” of the wedding weekend. Certain rules of decorum should be kept in mind for all wedding related functions. Note that the terminology has more bearing on the correct etiquette for each event. For instance, engagement party verses “a celebration in honor of” or a shower verses a luncheon, dinner or tea amidst extended friends. The Wedding Guest List offers the biggest opportunity to create hurt feelings. Everyone is excited about your wedding and wants to include those who are important to them. Culling the list has to be done with great sensitivity because you don't want to offend the feelings of anyone. I always recommend that the first order of business is to define your vision for the wedding and share it with both families in writing. 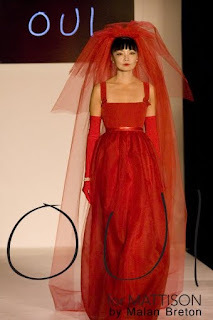 If you are set on a wedding with only 80 in attendance then those parameters should be communicated. Both families will know from the beginning that there will be limitations to the guest list. This is not a guaranteed method to avoid problems, but it does set some initial boundaries. Creating these initial boundaries will quickly put in check the possibility of going off in the wrong direction. Prepare your list with consideration. 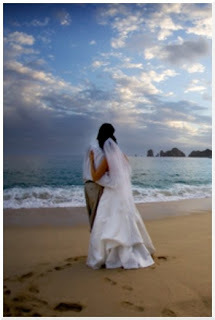 Most pre-wedding parties are intimate affairs made up of close friends and family. Attending a wedding celebration builds excited leading up to your wedding and provides the guest an unspoken guarantee that they will be honored with a wedding invitation to witness your big day. It is misleading and unacceptable to invite guests to parties and not invite them to your wedding. According to The Emily Post Institute, Anna Post writes in her book Emily Post’s Wedding Parties “Anyone invited to any wedding party (office’s showers excepted) must be invited to the wedding”. Be sensitive to your single friends. From college age on, your single guests should be extended an “and guest” invitation. Your wedding is a party. Your wedding is a celebration. They too would like to be comfortable and enjoy the entertainment along with you. It’s no fun sitting alone and watching others dance and have a good time. The Wedding Guest List is fluid. It will expand and contract. However, by giving your families initial parameters you will set the tone that you will be planning your wedding with guidelines. Knowing that guidelines are in place, hopefully all will be inclined to be sensitive about who they should request to be invited. Wedding Seating Chart by Jan Boyd Calligraphy. 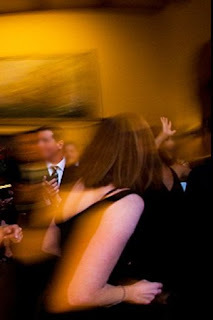 The Engagement Party is an exhilarating celebration usually hosted by the parents of the bride. It can be hosted by another relative or friend provided the family of the bride has been given the first opportunity. 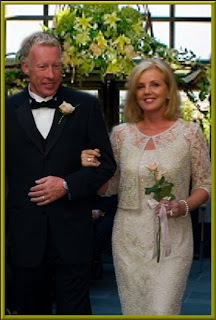 With our globetrotting society, families who live out of town may also host their own festivities to honor the newly engaged couple, however, out of courtesy; first discuss the date with the family of the bride. The guest list for your Engagement Party should be a mirror of your wedding guest list as all guests invited to your Engagement Party should be included on your wedding guest list. Engagement parties are not necessarily a gift giving occasion. Only if all guests come bearing gifts should you open them in their presence. 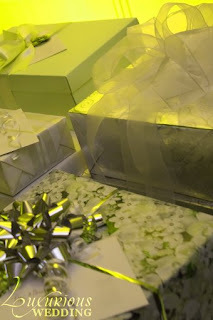 Unlike the Bridal Shower where the opening of gifts is the focus of the celebration, gifts brought to your Engagement Party should be acknowledged but opened at a later time. Regardless if you expressed your gratitude in person, please be certain to send a handwritten thank you note to each guest who provided you with a gift. A bridal celebration captured by Kevin Kramer of Advantage Photography. Bachelor and Bachelorette parties are usually the one last bash of your single life and are held from two months to one week before the wedding day. Although not obligatory, they are a time honored tradition where many of the antics of the evening make for amusing tales for years to come. The Bachelor Party is generally organized by the Best Men and attendee’s commonly include the Groom, Groomsmen, close male friends, family members typically close in age to the groom, brothers, cousins, future brother-in-law, etc. and may be extended to include the father and future father in law of the groom. 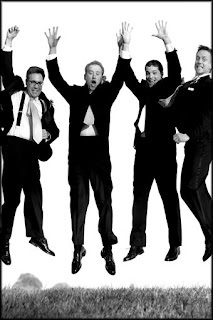 The Bachelor Party is typically a Dutch affairs with attendees responsible for their own share of the cost of activities. In addition, the best man and groomsmen should contribute for the cost of the groom. Although it is common practice to go wild for bachelor blowouts, more men are choosing to have a much more low key affair. A few ideas the gentlemen might consider would be a gathering at a trendy restaurant, a golf outing, an extended fishing trip, or a robust weekend getaway. The Bachelorette Party is generally organized by the Maid of Honor. The Bridesmaids should always be available for assistance, if necessary. The Bachelorette Party guest list includes the Bride and her bridesmaids, close friends and family typically close in age to the bride, sisters, cousins, future sister-in-law and may also include her mother and future mother in law. Bachelorette Party’s are also frequently Dutch affairs with attendees responsible for their own share of the cost of activities. The maid of honor and bridesmaids contribute to the cost of the bride. A few common practices of the ladies include an intimate dinner at the Brides' favorite restaurant, a visit to the local Vineyard for a wine tasting party and the telling of tales, a luxurious spa day or weekend, a surprise weekend getaway or an old fashion slumber party held at a fabulous Bed & Breakfast or luxury hotel. A newer trend has many couples opting to host a joint Bachelor & Bachelorette Party for one big celebration. Any type of activity is acceptable as long as you practice self-control and do not embarrass yourself, your honoree or your guests. Bridal Showers were born from early dowry practices when a less fortunate bride and her family may not have had the money to provide the necessary dowry for their daughter; or when a father refused to give his daughter her dowry because he did not approve of the marriage. In such cases, family and friends of the bride would gather together and 'shower' the bride with gifts to compensate for her lack of a dowry. This showering of gifts allowed her to set up her future home and marry the man of her choice. At one time, it was considered a breach of etiquette for the family of the bride to host the bridal shower. Today, a bridal shower may be hosted by anyone except the couple. Bridal Showers are typically held between eight and two weeks from the wedding date with the opening of the gifts as the central focus and highlight of the event. Bridal Showers are usually very intimate affairs. 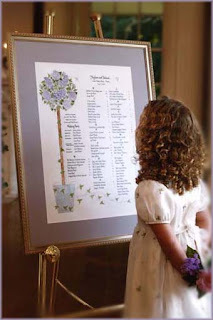 The guest list is commonly made up of family, friends, and attendants of the bride. Tradition once held that showers were a 'women only”' affair. Now more brides are choosing to include the groom plus his friends and family. These are commonly known as a Jack and Jill Shower. Etiquette dictates that it is imperative that anyone invited to your Bridal Shower must be invited to your wedding; otherwise it appears as though it is just a ploy for gifts. The one exception to this rule is when co-workers or club members wish to give a shower as a way of offering their congratulations. A Bridal Shower in honor of A Midsummer Night's Dream Theme Wedding. 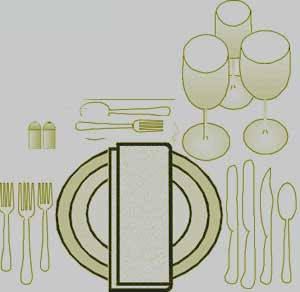 The Rehearsal Dinner is the most intimate gathering of all pre-wedding related festivities. Often set in a more relaxed atmosphere, this exhilarating dinner party allows you to mingle among your closest family and friends in a more personal way. Traditionally hosted by the family of the groom, this event may also be hosted by another family member of the couple, provided the opportunity was first given to the family of the groom. The Rehearsal Dinner follows your ceremony rehearsal. This is a great opportunity to do something completely different and apart from your wedding theme as the decor for the Rehearsal Dinner does not necessarily have to match although many couples choose to compliment their wedding decor in an effort to build excitement and anticipation. The guest list for the Rehearsal Dinner must always include: Parents, siblings, children of the bride or groom, attendants and officiate. In addition, step-parents, their spouses and the spouses, the fiance or live-in partner of the members of your wedding party are also included. It is polite to also extend the invitation to your young attendants and their parents. Customarily invited: extended family members - grandparents, aunts, uncles, nieces, nephews, cousins, godparents and close friends. Discretionary Invitations: If your budget permits, you may also include out-of-town guests. Destination weddings and more intimate affairs present unique circumstances. 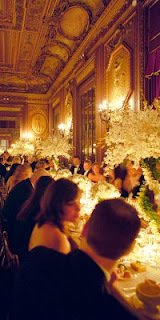 A grand gathering is acceptable to honor your wedding and require an expanded guest list. Perhaps you may host a 'Celebration in Honor of' celebration. 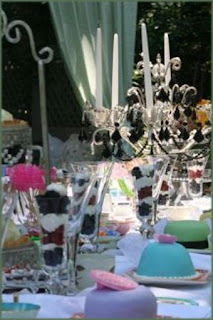 Another popular theme is a 'Belated Reception Celebration'. These post-wedding affairs allow the inclusion of extended family and friends and provide a chance for those not able to attend your Destination or Intimate wedding to offer their best wishes to the new couple. 'The Seating of the Mothers' traditionally begins the wedding ceremonial procession down the aisle to their designated seats of honor. With blended families, the seating has become more complicated. In the case of step mothers it is not as common for them to proceed down the aisle unless they have had a hand in raising the bride or groom, or are thought of as an honorary mother. Taking into consideration that all family dynamics are different, one must decide if it is best for his or her family to have their step mother partake in the Seating of the Mothers. In the blended family processional, the step mother is escorted down the aisle in front of the biological mother. The mother of the bride is always the last person to be seated. This signals that the ceremony is about to begin and that no other guests may be seated or escorted to their seats through the center aisle. Ceremony Seating image by Kevin Kramer Advantage Photography. The Hope Chest became a wedding tradition that evolved out of necessity. In a previous era, many less fortunate families could not afford a dowry. As a means to attract a potential suitor, mothers began to teach their young daughters the essentials of homemaking. These qualities were seen as a value to young men and their families. Dreaming of their wedding day, the young women began to knit, sew and embroider their own linen, towels and fabrics. In "hope" for a marriage proposal they began collecting their trousseau, their hand-made items and all the necessities that would be needed to set up their bridal residence. Soon, fathers began to build an elaborately decorate chest to store these lovely items. The "Hope Chest" soon became popular. The Hope Chest began as a wooded box or trunk that was lined with cedar in order to preserve the gentle fabric contents. As it evolved, it became more elaborate. Expensive woods were used with decorative carved designs. While father's proudly built the chest as a gift to their daughters, their mother had the honor of presenting it to the young bride and assisting her in filling it. It soon became a beautiful and expected wedding tradition. The Hope Chest was soon passed down from mother to daughter as a treasured family heirloom. The tradition quickly caught on continued throughout Europe and became popular in the United States until approximately the early 20th century. Popularity increased again following World War I when the famed Lane Furniture Company began a romantic marketing plan to promote their new Lane Hope Chest. Even today, those brides who have a traditional design style for their new home may enjoy the added decorative and storage features a Hope Chest brings to any room. Hope Chest by Jessica McClintock. It is considered appropriate for your gift to be delivered to the couple prior to the wedding. 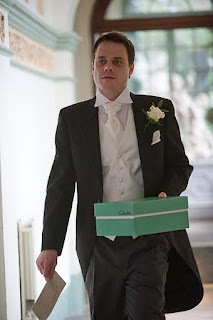 Depending on the circumstances, delivery should be to the home of the bride or her parents. Customarily you should give what you can afford, although your generosity should take into consideration the style or formality of the reception and if the gift is from you and your children or a date. 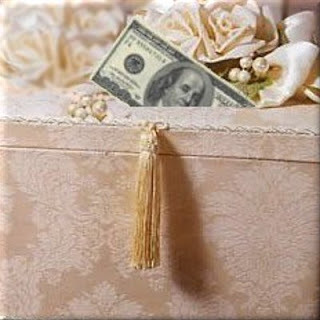 When presenting a monetary gift before the wedding, the check should be made out to the bride in her maiden name. On the wedding day or after, it should be made out in the name of the groom or to Mr. & Mrs.
Look for the Gift Table at the wedding reception where you will place your thoughtful and beautifully wrapped gift. The Gift Table always includes a decorated Gift Card receptacle or Money Box for you to insert a monitory gift inside a card expressing your best wishes and sentiments. 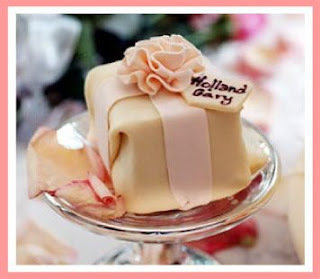 If your invitation includes; “And Guest”, it is the responsibility of the addressee to secure the gift for the couple. When selecting your gift, whether that be from the registry or monetary, please consider that it was a thoughtful gesture to have been extended an “And Guest” invitation. 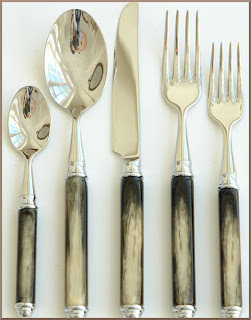 You may want to consider providing the couple with a gift that represents both you and your guest. 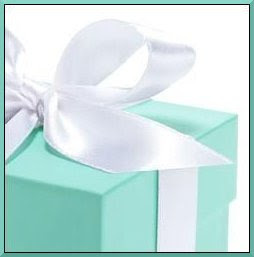 Married couples, those who live together or are engaged may also provide one gift. Although etiquette allows guests up to one year following the wedding to send a wedding gift, we know that receiving a wedding gift in the midst of all the excitement and celebration will make your gift extremely meaningful and memorable. 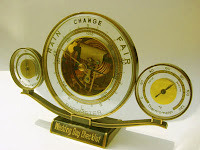 Have You Checked Your Wedding Guest Barometer ? 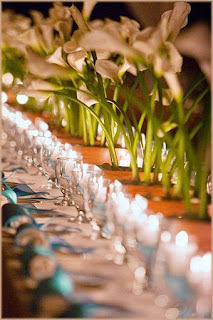 It is a tribute to you and an honor when invited guests join in the celebration of your love and union. Their acceptance of your invitation puts them in a very special category. 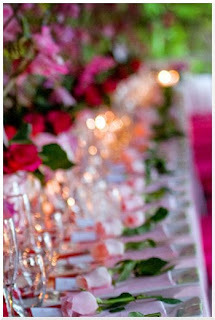 As with any guest invited to your home, you must treat your wedding guests with the same gracious ness. You have extended an invitation, therefore, you are responsible for their comfort and enjoyment. Yes, it is true, you are the star and they are your audience; but the enjoyment your guests experience will ultimately determine the success of your wedding. During your wedding planning, peak out from under your veil of excitement for a moment and imagine how you would feel attending your wedding as a guest. Put yourself in their place and visualize what they might encounter from the moment they arrive at the church. Has everything been arranged with your guests in mind? 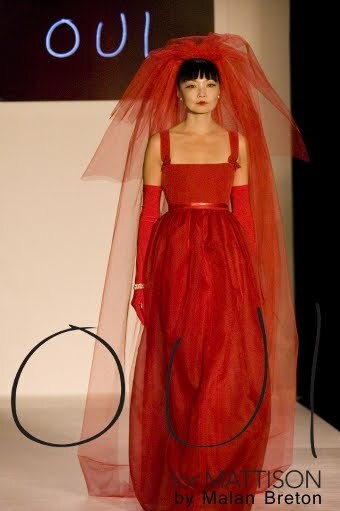 Will they be able to hear your vows, or did you forget to include an amplification device? Were the Wedding Programs distributed to everyone? If the logistics are challenging, did you provide a Directions Map? 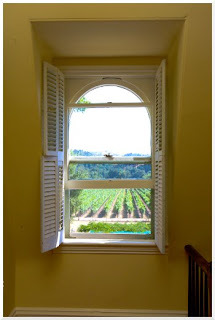 Overlooking the tiny minor details can leave your guests isolated and confused. It is important to be mindful of the additional expenses that attending your wedding might entail. Beyond the wedding gift there is the time and money spent traveling and possibly overnight accommodations. So include a guest experience barometer on your wedding planning checklist and not only will you have the wedding of your dreams; you will appear on your guests' 'Best Wedding I Ever Attended' list. 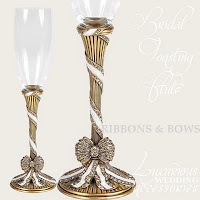 Traditionally, wedding gifts are given to the bride and groom as a symbolic gesture of congratulations. A wedding gift is not something purchased in a generic way. It is a well thought out display of contribution. 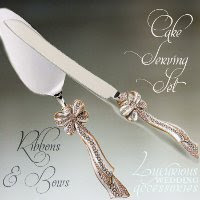 A wedding gift often reflects the givers desire for you to increase your enjoyment of a cherished part of married life. Perhaps the gift will be a magnificent vase to extol the pleasure that fresh flowers bring to a room. Perhaps a serving platter that will flatter any culinary delight that you prepare. Whatever the gift, the bride and groom should acknowledge and appreciate the thoughtfulness behind the gesture. The way you receive the gift and express your gratitude will be remembered by the gift giver. Grace and sincerity will go a long way in the memories of your guests. 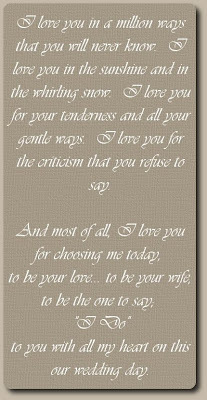 The best way to make them feel special following the wedding is to present them with a Thank You note immediately upon receiving their wedding gift. I encourage you to include something personal about their attendance and what it meant to you to have them witness the happiest day of your life. 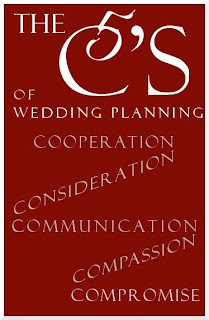 When invited to a wedding many take their own life situation into consideration when responding to a wedding invitation. You are single and you don't want to go alone. You have a darling child and are sure that he will be so well behaved no one will notice he is there. The way in which an invitation is addressed tells you what the couple had in mind when inviting you. If you were invited with a guest the outside envelope would be addressed to: Mr. John Smith. The inner envelope would be addressed to Mr. John Smith and Guest. If children are invited, the invitation would be address with “and Family" or listed directly under the adult. Adult children living in the same household should receive their own invitation. Do not put the couple in an embarrassing situation. Do not ask them if you can bring a date or your children to the wedding. And under no circumstance should you ever add names or additional number of guests to your reply card. A wedding is planned like clockwork. There is no time to rearrange seating to accommodate any additions. Please be respectful of your invitation. It is an honor to be chosen to share their special day. So please be honorable and respect their wishes. Invitation Response Card by Luxurious Wedding Invitation.